We took the train down to Florence from Venice (it’s a quick 2 hours) and made our way to our apartment that we found on Airbnb. If you’re not familiar with this website you are missing out. Airbnb.com is a vacation rental website where owners list apartments and rooms for rent. You can rent entire houses/apartments or a private room in someone’s home. You can read reviews, see photos, and interact directly with the apartment owner. I’ve used it numerous times on vacations to Europe and have stayed at some fabulous places. Our apartment in Florence was no exception. We were in the Santo Spirito neighborhood which is just across the Arno river away from the chaos of the city center (we were a ten minute walk to the Duomo) and were about a one minute walk to the Palazzo Pitti and a 5 minute walk to the Ponte Vecchio. Great location! If I’m staying in a city for a few days I really enjoy having an apartment instead of a hotel because I enjoy having a kitchen for breakfast, snacks, or a possible meal. Also, it gives me a chance to feel like a local. Our apartment was fantastic–completely redone inside with modern furnishings, spacious, clean, and came with a welcome bottle of wine from the owner!! Yes! I would definitely recommend everyone to stay here next time you are in Florence. Best part of it all?? Only 100 dollars night!!! This was a spectacular deal for Florence in the busy tourist summer season. Check out the listing of the apartment here. 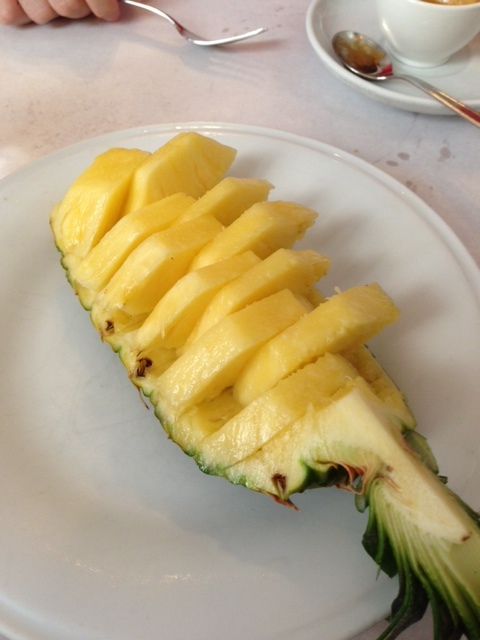 Our first stop for lunch was at Trattoria la Casalinga which was right around the corner from our apartment. We had no intentions of eating there and just happened to stumble across it because the line was out the door. We waited for about 20 minutes for a table and observed many Italians eating there on their lunch break. I found out later that the trattoria has been open for 50 years and is an extremely popular spot for locals and tourists due to the inexpensive, simple fare. We enjoyed a simple yet incredibly tasty meal and if we were staying for more than a few days in Florence I would have definitely returned. For classic Florentine recipes make sure to visit here. 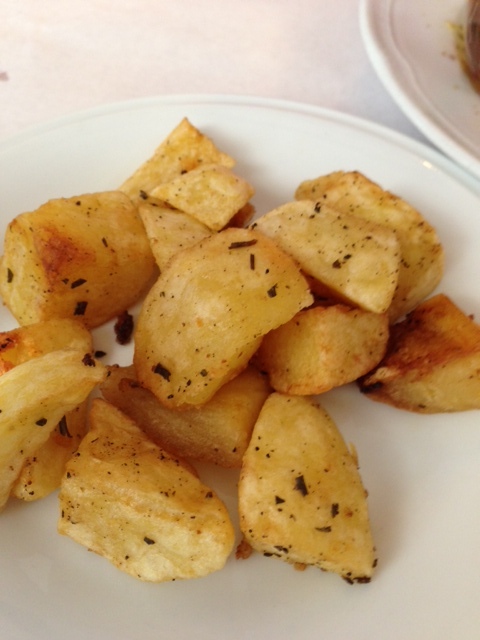 The best roasted potatoes I’ve ever had–how did they make them taste so good?? If you’re in Florence be sure to check out the Mercato Centrale. We had a bit of trouble finding it but once we got inside it was foodie heaven. Row after row of stalls filled with cheeses, meats, seafood, and prepared food. I could have spent hours here. One stall that we visited was Nerbone. This is one of the most popular spots in the mercato and they are know for their boiled meat sandwiches. Make sure to check them out. The mercato centrale is a definite stop for anyone who is interested in food. For dinner that night we headed to Il Santo Bevitore. We made reservations for 10pm (everyone in Italy eats late during the summer) and were excited to try this restaurant that touted modern interpretations of classic Italian dishes. Unfortunately this was our least favorite meal of the entire vacation. I guess due to our late dining time the kitchen was out of three dishes that we ordered so we were forced to choose other options that we weren’t thrilled about. The food was good, not great, and it was also our most expensive meal of our vacation. It came to us highly recommended by locals, fellow food bloggers, and online reviews so you can imagine my disappointment when the food did not meet my expectations. The zucchini flan was tasteless, my pasta was good but over salted, and my boyfriend’s pasta was so spicy it was almost inedible (and he looooves spicy food). After hearing so many positive remarks we felt deflated and handed over our money to pay and left with our tails between our legs. The food was presented beautifully but presentation means nothing if the food doesn’t taste good. Perhaps we visited on an off night, but I wouldn’t visit again. There are many other restaurants that are less expensive and where the food really shines. Please excuse the low lighting! We shook off our bad dining experience at Santo Bevitore and spent the next day in the Tuscan countryside doing a full day wine tour (I’ll do a separate post on that). Our helpful tour guide, Bernardo, who was born and raised in Florence suggested a restaurant for us for our last dinner in Florence– Coquinarius. Once again we arrived around 9:30pm and were seated within 20 minutes (we had made a reservation). The service was a bit off in this restaurant but we realized that there were only 3 servers for the entire place!! And it’s a not a small restaurant! 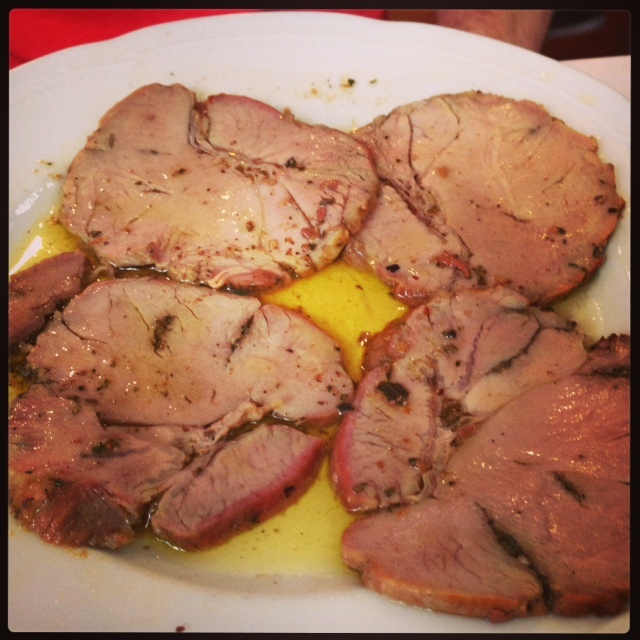 The great food totally made us forget our dining experience at Santo Bevitore! 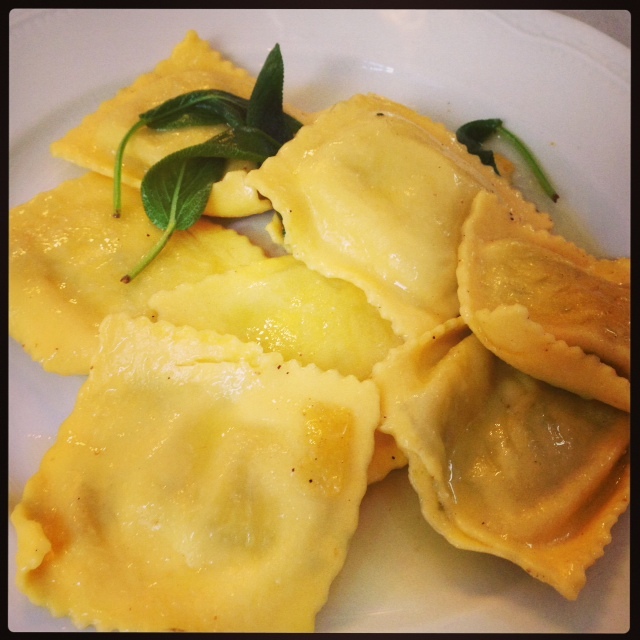 This is what innovative Italian food should be like. My beau had an interesting dish of pappardelle with a rabbit ragu, fresh pecorino cheese, over a grean pea puree. Amazing! We started with a simple bruschetta and a crostini with asiago and guanciale. I ate a large salad because after all the wine and meat we had eaten during the day I needed a break! We shared a divine grapefruit ricotta cheesecake and left happy. 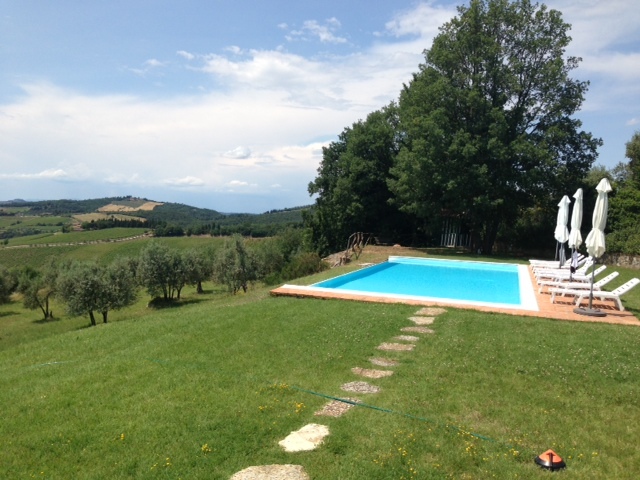 Stay tuned for my next post on the Tuscan countryside, winery tours, a crazy butcher, and a bed & breakfast with this view….. Loved all your tips – wished I had them beforehand because we missed that market. We’ll just have to go back again soon!